Within a mile and a half of this marker are numerous prehistoric sites, several of which date from 2000 BC. Native Americans occupied the northern river section from about 4000 BC until the arrival of Europeans after 1500 AD. Riverbank settlements, permanent villages, and small seasonal campsites were common prehistoric site types. Abundant natural resources provided inhabitants with opportunities to hunt, fish and collect shellfish and plants. By the 1770's, when William Bartram explored this area and Francis Fatio established his homestead, few native peoples remained in the region. Today, shell refuse deposits, pieces of pottery, stone and bone tools, and soil stains provide archaeological evidence reflecting the lifeways of those early Florida residents. Erected by Sponsored By Arvida, A St. Joe Company. Marker series. 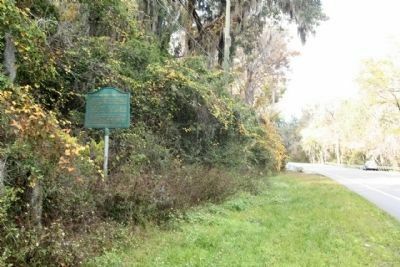 This marker is included in the William Bartram Trails marker series. Location. 30° 2.743′ N, 81° 39.97′ W. Marker is in Switzerland, Florida, in St. Johns County. Marker is on State Road 13, on the left when traveling north. Touch for map. Marker is in this post office area: Saint Johns FL 32259, United States of America. Touch for directions. Other nearby markers. At least 8 other markers are within 4 miles of this marker, measured as the crow flies. 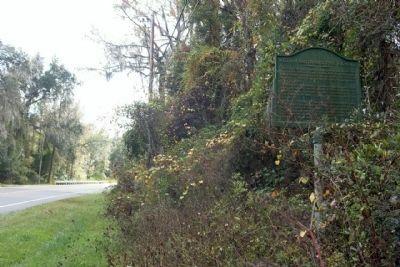 William Bartram Trail (approx. 0.7 miles away); St. Johns County / New Switzerland Plantation (approx. 2.3 miles away); St. Margaret's Episcopal Church and Cemetery (approx. 2.3 miles away); Camp Chowenwaw (approx. 2.8 miles away); Green Cove Springs (approx. 3.6 miles away); The Village Improvement Association Woman's Club (approx. 3.7 miles away); Beluthahatchee (approx. 3.7 miles away); Old Clay County Courthouse (approx. 3.9 miles away). Touch for a list and map of all markers in Switzerland. More. 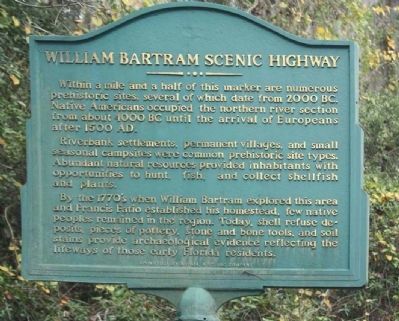 Search the internet for William Bartram Scenic Highway. Credits. This page was last revised on January 2, 2019. This page originally submitted on December 19, 2012, by Mike Stroud of Bluffton, South Carolina. This page has been viewed 580 times since then and 10 times this year. Photos: 1, 2, 3. submitted on December 20, 2012, by Mike Stroud of Bluffton, South Carolina.